I’ve been putting off reading this to try and break up the wait for volume four in the New Year but I couldn’t wait no longer. Elephantmen has easily been the top of my must read list. It’s an amazing combination of ultimate sci-fi awesomeness meets mutants and crazy chicks. Mappo a mad genius in genetic experiments has created Elephantmen (Elephantmen vol 1 Wounded Animals) – the ultimate soldier. Born and raised for war. A war between Africa and China over FCN virus infected Europe has turned the Elephantmen into war toys. They are feared world wide as stories of their fearsome animal nature have spread. Now the Elephantmen are rehabilitated into society after the UN took down Mappo and sent him into hiding, 15,000 of these genetic experiments have been given jobs and begun new lives among a mostly fearful society. Dangerous Liaisons could be the best volume yet. With the previous two volumes Richard Starkings has opened up a whole new amazing sci-fi filled world with endless possibilities and now it’s really starting to take shape. We’ve had an introduction to Hip Flask the detective who is a major hit with the ladies. Ebony Hide who so far has seemed content with his desk job after being a born and raised as a killer. Obadiah Horn has built an empire on his fame and making money from both sides of the law. Some Elephantmen haven’t had the same luck as being rehabilitated into society – Tusk was a warrior who was subject to the worst of the training as he was test subject to some of the most lethal chemical weapons and torture. He was left with brain damage, classified as extremely dangerous and left confined to a cage for ten years by Mappo and another twenty by the UN. Dangerous Liaisons really brings the story on track, so far Starkings has opened up a world with almost infinite possibilities and left the reader thinking what could happen next. With this book you really get excited from page to page as you start to get a real feeling of where the series is leading. The previously well hidden enemies of the Elephantmen have started showing up more and more leading up to the possible return of Mappo and the FCN virus. In previous issues we found out that Elephantmen being part human could breed and have hybrid babies but that story line seems to be either evolving or has just been put on the side for the time being. Either way I love the way Rich likes to toy with the readers, I’m still in partial shock when I thought Miki was going to die in the previous volume (Elephantmen vol 2 : Fatal Diseases) and now in mourning for the fallen hero Tusk. I’m super excited about how far Richard Starkings will take the series, after three volumes, four if you include War Toys you still have so much more to find out about the main characters. Bonus Material: The volume also has a comic included from an up and coming artist Andre Szymanowics called Suchi Nachos which got Andre a job drawing a comic in this volume. Also included is another sketch book which gives you an insight into how the character has evolved from Morats original sketch to the modern day Hip Flask. 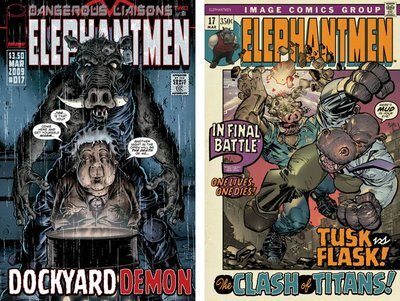 Again highly recommended – you really can’t go wrong with Elephantmen if you want an ongoing series. It still hasn’t disappointed and as long as Richard Starkings keeps writing with his amazing team of artists to back him up I can only see a bright legendary future for Elephantmen.